The University of Arkansas at Little Rock raised $60,000 for undergraduate mathematics and science students during the eighth annual Fribourgh Award Reception held Sept. 28 at Pleasant Valley Country Club. 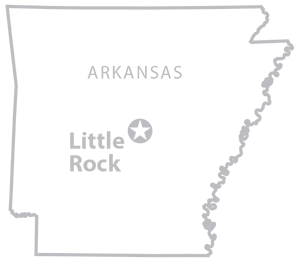 The Fribourgh Award recognizes individuals who made considerable contributions to the state through the disciplines of mathematics and science. 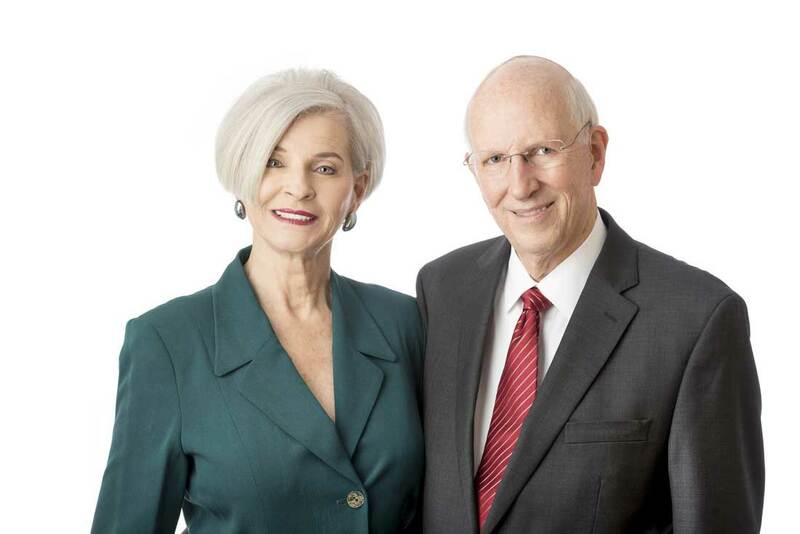 Jerry and Sherri Damerow, longtime supporters of Science, Technology, Engineering, and Mathematics (STEM) education at UA Little Rock, were honored as this year’s recipients. Jerry Damerow, who serves on the Science Dean’s Council at UA Little Rock, is retired Ernst and Young partner and currently chief financial officer at InterveXion Therapeutics LLC, a University of Arkansas for Medical Sciences BioVentures start-up company, while Sherri Damerow is an artist and retired kindergarten teacher. In 2009, the Damerows began funding an endowed scholarship for mathematics and statistics students that can be used for tuition, books, fees, room and board, and travel expenses. 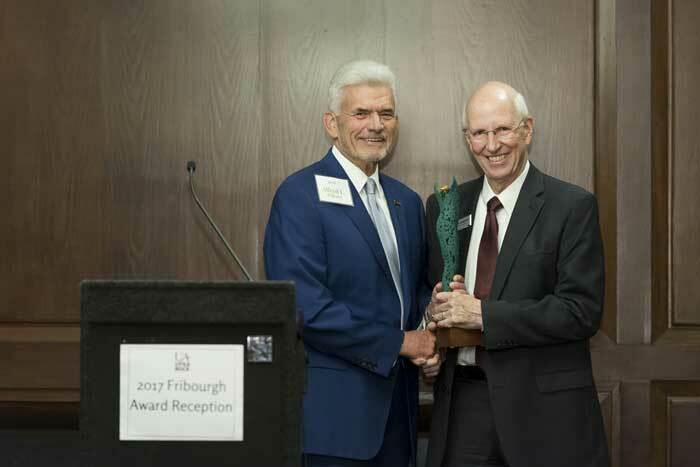 This year’s Fribourgh Award was created by Michael Warrick, professor of sculpture. Warrick designed a miniature version of his sculpture, “Youth,” which was recently delivered to officials in Hanam, South Korea, to honor the 25th anniversary of the Sister City partnership between Little Rock and Hanam that began in 1992. The 14-inch award is made of bronze, walnut, and gold leaf. Warrick designed the award using 3-D modeling software. The piece is made of bronze, walnut, and gold leaf. Alfred Williams (left) presents the Fribourgh Award to Jerry Damerow (right) during the Sept. 28 award reception at Pleasant Valley Country Club. Photo by Lonnie Timmons III/UA Little Rock Communications. Proceeds from the event benefit the Science and Mathematics Leadership Endowed Scholarship Fund for undergraduate students at UA Little Rock. Tom Clifton, dean of the College of Arts, Letters, and Sciences, was proud of the fine example of student support demonstrated by the Damerows and the event’s supporters. Thanks to their generosity, Clifton was proud to announce that the 2017 Fribourgh Award Reception was the highest-grossing fundraiser to support the Science and Mathematics Leadership Endowed Scholarship Fund at UA Little Rock. So far, nine students have received scholarships from the fund. The most recent recipient, Lyle Arnette, has a 4.0 GPA and will graduate in 2018 with a bachelor’s degree in physics and a minor in mathematics. Meanwhile, the 2016 scholarship recipient, John Siratt, received a grant from the Arkansas Space Grant Consortium and interned with the NASA Langley Research Center this summer. His research finds applications in autopilot and autonomous drone systems to help program computers to correctly navigate planes using spherical geometry. UA Little Rock Chancellor Andrew Rogerson praised the event for putting the spotlight on supporting science and mathematics students through scholarships. There is a need for more students to major in STEM fields to fill gaps in the workforce and promote growth in the state and national economy, Rogerson said. The Center on Education and Workforce projects there will be a 19 percent increase in STEM careers by 2020.